The Vera Campus site is located to the north of the city of Valencia in a peaceful setting that borders with traditional farmland. 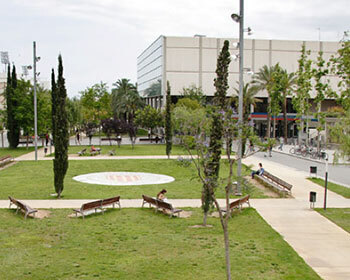 It consists of nearly 60 buildings arranged in an orderly manner around the Agora, which is the centre of life on campus. There are over 108,000 square metres of green spaces that house an open-air museum of sculpture. You can get to the campus site by city bus, underground, bike, taxi or car. The Vera Campus site welcomes close to 40,000 students who enjoy a full range of services: several cafes and restaurants of different types, driving school, pharmacy, travel agency, banks, bookstore, Fine Arts supply shop, Flower shop, bicycle repair, Sport shop, Hairdresser’s, etc. and a student center where you will meet the members of the student government and the different student organizations. Modern learning facilities include a library, and computer stations, all open 7 days a week. The sports facilities include an indoor swimming pool, a sports complex, a gymnasium, a running track, a Valencian pelota court (trinquet), a cycling track and several tennis and paddle tennis courts. It has all the facilities needed to provide high quality. 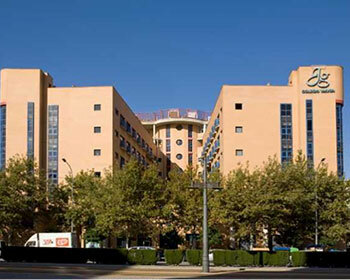 The Universitat Politècnica de València provides a free service to students to help them find accommodation that meets their expectations and needs. To do so, the UPV keeps a database with information about students and individuals offering and requesting shared flats, stays with a family or flats to rent. Additionally, international students can find accommodation directly on campus in an international residence: “Galileo Galilei”.